While the ECM Giotto is out of service waiting for a small part, I’ve been using the Pavoni and for a change took out the Bialetti Moka Express. I have the medium sized one that holds 6 cups and while it isn’t technically espresso, I like the rich full bodied moka that it makes with Lavazza “Qualita Oro” out of a vac pack. For those that don’t know, Bialetti has been making this stove top coffee maker since 1933. In Italy, where these are still made (although I’ve seen some steel Bialetti made in China…a shame), it is an iconic fixture in almost every home. The original model was and is made of aluminum–a material popular at the time as a sign of Italy’s modernity. They pots are also made by other vendors as well in both aluminum and other materials such as steel, glass, etc. Being a traditionalist, mine is aluminum. – Use coffee that is ground a bit coarser than you’d normally use in your espresso machine. – The instructions say to not tamp, but I do…lightly using the bottom of a plastic baby bottle. YMMV. 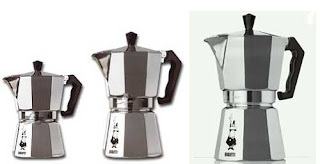 – Italians swear that the more you use the pot, the better the brew. I’m not sure why they think this, but my guess is that after a while without scrubbing with steel wool etc., that the pots start to oxidize a bit…and over time, this makes the metal more neutral to the coffee being brewed. So, I only rise the pot out with water and wipe off the residual coffee with a wet cloth. So far so good. Try it, you’ll like it. These coffee makers are relatively cheap and widely available. Next post: Has WiFi killed coffee shop culture?